We invite you, your family, relatives, and friends to join us for Sunday Worship services. Inspired worship can be anticipated! Most worship services include a Children’s Time, after which children from age 2 through seventh grade attend church school classes. We provide child care for infants and young children, opening at 9:40 a.m.
Family Worship takes place on the 3rd Sunday of the month. Children will be invited to stay in worship for the whole service, which will be shaped especially for families to worship together. The music will be a little different, and the prayers, scriptures and messages more understandable to younger folks. However, this service is not just for children—it’s for everybody. And the more generations we have present, the richer the experience will be. There is no church school during Family Sunday but there is nursery care. 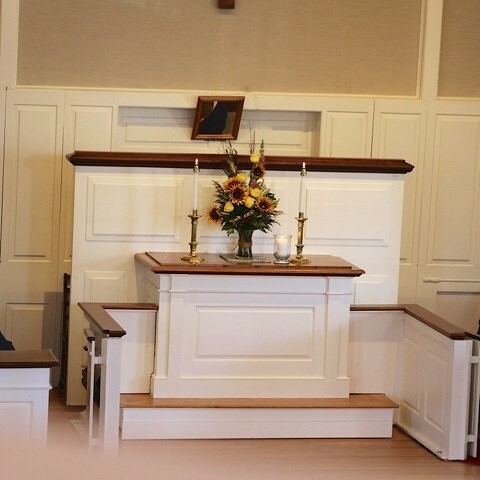 Early Worship Join us at 8:00am for an earlier worship once a month on the second Sunday of the month. It preserves the spiritual content of worship while allowing for those with full schedules to worship in a shorter service. Everyone is invited to enjoy fellowship and refreshments in the community room following Sunday services. Infant baptism is offered to those children whose parent(s) and sponsor(s) promise to assume certain responsibilities for the Christian nurture of the child. One of the parents or sponsors should be a member in good standing of a Christian church. 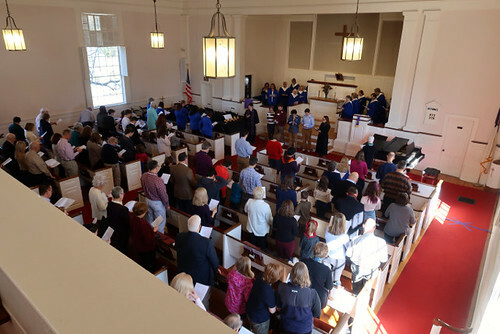 Baptism takes place in the presence of the community of faith gathered for public worship. A Pastor meets with prospective parents one time before the service to familiarize the family with the nature of the sacrament and the service. To make funeral arrangements, please speak with either one of our pastors, or call Andrea, our Church Secretary, at the church office: 673-3231. April 14th: Palm/Passion Sunday10:00 a.m.
We begin with the traditional waving of the palms and end with the Passion drama presented by our Senior High Youth. A prayerful reflective service with Communion and Tenebrae – a commemoration of Jesus’ last night with his disciples. Walking the Way of the Cross in Milford – begins in Bicentennial Park. Ecumenical outdoor prayer service following the NH Black Heritage Trail. 6:00 a.m. Sunrise Service on the Amherst village green. Celebrating the Resurrection at daybreak followed by a light breakfast in the community room. 10:00 a.m. Easter celebration service with our Chancel and Bell Choirs. Praising God with a joyful noise! September 1st -June 30th: 10:00 a.m.
July 1st - August 31st: 9:00 a.m.
Child care provided for infants and toddlers in our fully staffed nursery during Sunday worship service. 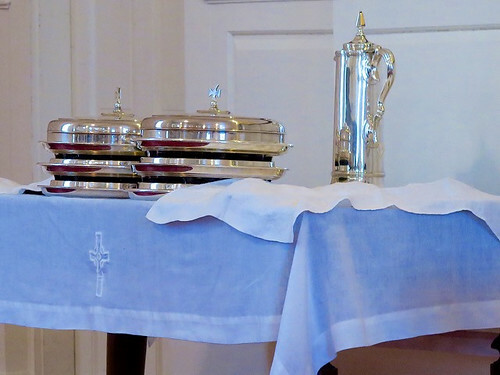 Holy Communion is served the 1st Sunday of the month. Worship For All Ages 3rd Sunday of the month. We will come together as the Community of Christ to sorship God with meaningful music, communal prayer, and an "object lesson" message to engage ALL ages. This service is SHORTER and more INTERACTIVE than our traditional service and each will have a theme to frame our worship. We welcome all ages but please note nursery care is still available and our Kindergarten-Pre-K kids have the option of staying in worship or going to their classroom for an activity/lesson if preferred. The busyness of our lives sometimes leaves many of us looking for the opportunity for quiet and reflection. The United Church of Christ offers an easy way to receive a daily devotional message, The Still Speaking Daily Devotional. These short messages will arrive by e-mail every day to feed your mind and spirit and engage thought on a variety of subjects. To read the archives of past messages or to sign up to receive the Daily Devotional, visit http://www.ucc.org/feed-your-spirit/daily-devotional/archive.html. HOW WELL DID YOU HEAR THE SERMON THIS MORNING? Clearly? Just barely? Heard it, but it sounded really far away? The deacons recognize that some worshipers have trouble hearing. There are various pieces of equipment to consider, but we need to know… what would be helpful to you? Do you wear a hearing aid and would benefit from a system that interacts with it? Do you not normally wear a hearing aid, but a headset to boost the sound level would be nice? Let us know! Please speak with deacons Don Potter or Judi Simpson. Your feedback will help us determine what equipment would work best for us. 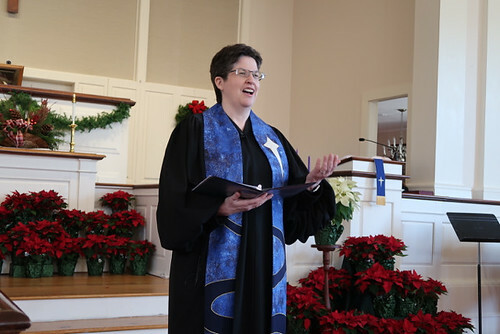 Each week during the worship service, we lift up in prayer joys and concerns brought forth by members of the congregation. We also forward these prayers via email to members so that during the week, the prayers continue. Would you like to be a part of this prayer chain? If so, send an email to Andrea in the church office and she will get you included on this list. The prayers we offer in church each Sunday unite us all to one another in a bond of faith and hope. These joys and concerns continue beyond the Sunday service, and we can bring them more closely into our hearts and minds by continuing to pray them during the week. More than 50 individuals and families are receiving the prayers each week via email. If you would like to be a Partner in Prayer, please contact Charlie Glover and you will be added to the prayer list. This is also a way to keep in contact with our church family when we are absent from a service.